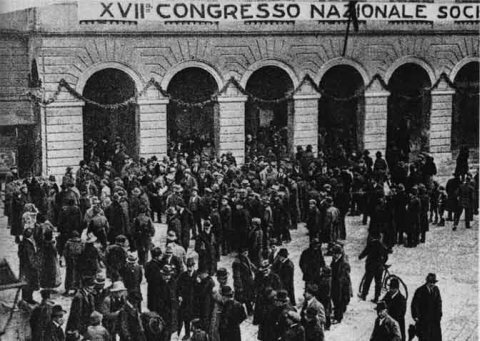 Today (January 21, 2011) is the ninetieth anniversary of the founding of the “Communist Party of Italy, section of the Third (Communist) International” [PCd’I] at Livorno (January 1921). This gives us a suitable excuse to begin a long overdue project by translating into English the collection of Onorato Damen’s writings on the animator and inspiration of that party in its earliest days, Amadeo Bordiga. We begin by publishing the obituary Damen wrote on Bordiga on his death in 1970 entitled Amadeo Bordiga - Beyond the Myth and the Rhetoric. As is well known in the communist left, Bordiga along with the Left were ousted from the leadership of the party they had founded by the manoeuvres of the Gramsci-Togliatti alliance in concert with a Communist International which was already degenerating into an arm of Soviet foreign policy. Damen and Bordiga took different paths after this. Both were imprisoned on Ustica (an island just north of Sicily) where they were joined by Gramsci (thus setting up a famous “party school”) but on release Bordiga retired to private life. Damen continued to fight both the Stalinists (he was expelled from the PCd’I in 1933) and the Fascists who imprisoned, or subjected him to internal exile constantly until 1943. During this period he even organised a prison riot in Civitavecchia. It was to Damen that those who returned from exile in France and Belgium had to turn in 1943-5 to found the Internationalist Communist Party, the only party to unambiguously oppose all imperialisms in the Second World War. Originally organised clandestinely, the Party grew on a wave of strikes and rising proletarian consciousness to gain thousands of members throughout Italy (and with offshoots in France, Belgium and the USA). However the start of the post-war boom and the establishment of the Italian Republic (with US capital as godfather) saw the party faced with a decline in membership. Bordiga had never accepted all the party’s positions (as Damen makes clear here) and thus had not joined it. He now considered that any attempt to maintain a party which attempted to stay linked to the working class was impossible. He began to argue that the party should return to the work of study rather than attempt to remain in contact with the wider class. Although there were other significant political differences (on the USSR, on the nature of the internal organisation of the party, on trades unions, on the national question and on the relationship of party and class) this was how the debate between them began. Increasingly bitter, it finished with the split of 1952 when the Bordigist Programma Comunista and the International Communist Party was founded. After nearly 60 years there are several Bordigist International Communist Parties each claiming to be the unique representative of the working class but only one Internationalist Communist Party (Battaglia Comunista) which is today at the heart of our tendency. We hope that by publishing more of Damen’s writings, as we shall do this year, we will emphasise the contribution he made not only to our tendency but also to the international working class. Translation Note. We have been greatly assisted by the fact that the full text of the book Amadeo Bordiga - Beyond the Myth and the Rhetoric has recently been translated into French and will soon appear as a book. The English translation has been made by cross-referencing the French and Italian versions. The subheadings appear only in the English version and the footnotes are expanded from the French version (with additional material from the Italian version). Despite this we are aware that at a distance of the 60 years some of the arguments may still appear obscure to present-day readers. We hope to gradually make these clearer as we produce more of Damen’s writings. In the meantime we welcome any comments and questions that may arise from the already published material.